A lot has changed with my personal life since 2017 came to a close. I'll share some details in a future blog post, but the most major life change? And I'm thrilled about it - because I had been praying for God to open some very specific doors. Little did I know, opening those doors would lead to some major adjustments. Heading to the gym at 8pm was no longer an option. And as it turns out, starting my new job would turn everything about my regimen upside down. I'm in the 8a-5p office culture now, which means wash day before work ain't happening. Factor in waking up at 4am to work out, and it REALLY ain't happening. I started my new job mid-January, and it wasn't until this wash day with Juicy Essence that I ACTUALLY washed my hair. Shameful, I know. 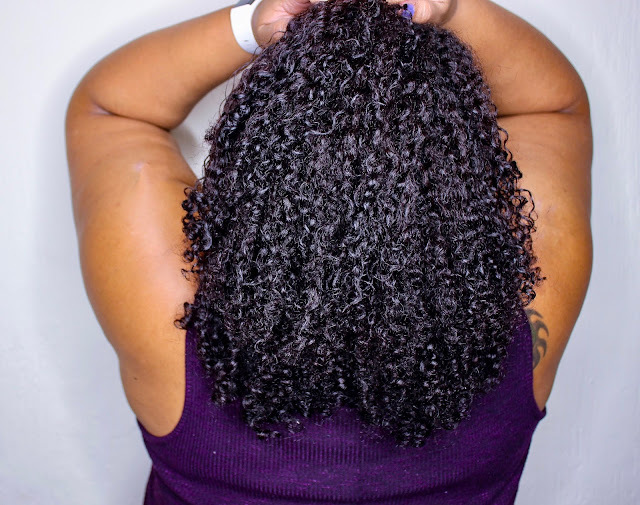 Instead of going through my normal process of alternating between shampooing and co-washing, then deep conditioning and taking my time to style, I would shampoo, condition, and pin my hair back with whatever leave-in or cheapie condish was inside the shower at the time. On co-wash days, I'd co-wash, rinse, and slap more conditioner in. If my hair wasn't pinned up halfway, it was slapped into a damp bun. I committed the cardinal sins of natural hair. To get myself back on track, I committed a weekend to caring for my hair like I used to in the good ol' days - and I commissioned Juicy Essence to help me out. My hair was tangled, dehydrated, and severe need of moisture, so I know Juicy Essence had what I needed to bring my natural hair back from the brink. 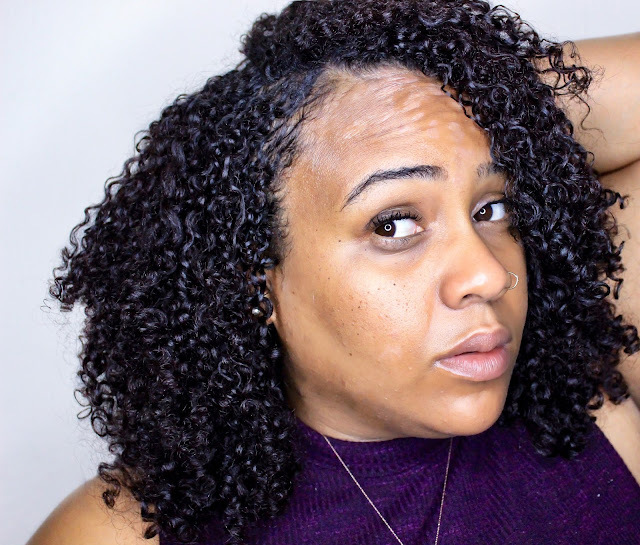 In the video below, I show you how I used the Juicy Natural Conditioner to detangle and rehydrate my freshly shampooed natural hair. I also show how I carefully styled my wash and go to last for several days, by infusing much needed moisture from the Juicy Detangling Mist and Juicy Natural Gellie. The video above will have you seeing and believing in the moisturizing power of Juicy Essence. But if you need more information on ingredients, price point, and my detailed thoughts, keep reading below. All Juicy Essence products are handcrafted with natural and naturally-derived ingredients. They're also curly girl friendly and coconut oil free - although I'll need to double back and confirm that on the Juicy Natural Conditioner tip. All 3 products from Juicy Essence featured in this review are protein free as well. Juicy Essence products are available for purchase at www.juicyessence.com. Cetearyl Alcohol: Considered "fatty alcohol" -- NOT to be confused with drying alcohols such as ethyl. Acts as a lubricant, thickener, and emollient and gives conditioner its velvety feel without making hair greasy. Also used to keep product ingredients from separating. Palm Stearic Acid: Palm-derived triglyceride used to condition and protect the hair without making it dull or heavy. First things first - the Juicy Natural Conditioner smells like a tropical paradise. At first pump, it instantly reminded me of my beloved Mango Dip. The consistency is smooth, creamy, and velvety - thick, but not too thick. Definitely spreadable and full of moisture. I used Juicy Natural Conditioner after giving myself a much needed shampoo. 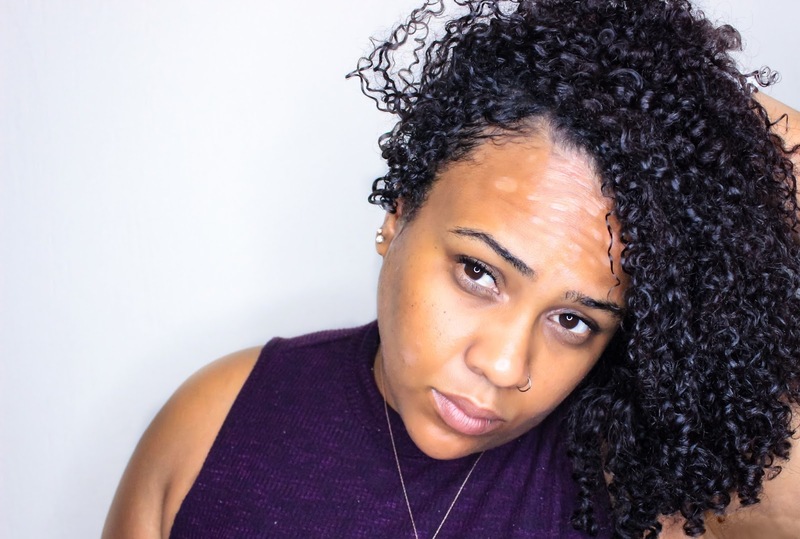 I needed every drip drop of its detangling and hydrating prowess to bring my limp, tangled curls back to life. And let me just say this - it DELIVERT. Peep the video - you'll see for yourself how with just a few strokes, I was able to maneuver my beloved Felicia Leatherwood Detangle Brush through my hair without much fight or fuss. This was the ultimate test - I didn't pre-poo or detangle prior to shampooing. After 20 minutes with heat, I rinsed the Juicy Natural Conditioner from my hair and fell in LOVE with how smooth, hydrated, and soft my strands felt. I knew my curls were back on track to poppin'ville. If your hair is on Sahara struggle mode, definitely look into the Juicy Natural Conditioner. It's the perfect multifunctional product for all textures and types, and helps bring dry, tangled, limp hair back to life after just one use. Leave it to me to fall in love with the one product I didn't think I'd care for. Y'all know I don't really get down with sprays like that (I keep saying that, but bomb sprays keep happening lol), but the Juicy Detangling Mist is something like a miracle. I decided to use it as my leave-in, and fell in LOVE with the instant shine, frizz-fighting, and of course, moisture. I'm swooning over the fact that the Juicy Detangling Mist is aloe-based, which my curls ADORE. Low pH, high moisture products make my curls pop in a real way (but also give me mad shrinkage lol). Although the spray is white, it dries clear and in combination with the Juicy Natural Gellie, leaves my hair moisturized for daysssssss. To be honest, I'm not a huge fan of the spray bottle mechanism. But for the consistency of the Juicy Detangling Mist, I don't think there's a better delivery system. So for now, I'll just improvise and pour from the bottle to my hand. If your hair loves aloe vera, you'll love the Juicy Detangling Mist. It makes an amazing leave-in, refresher, and detangler. Lecithin: Oily substance that functions as a key building block of the membranes inside and outside of plant and animal cells. Lecithin is helps moisturize and form a protective coating on the hair to counteract aging, damage, and dryness. Kosher Vegetable Glycerin: Vegetable-based humectant that absorbs and retains moisture from the air. Carbomer: Blend of acrylic acid monomers that acts as a viscosity controlling agent (thickener). Juicy Gellie... Not a gel, but still BOMB! I gotta be honest with y'all. When I read the ingredient list for the Juicy Natural Gellie, I just KNEW it was a gel. I ain't too proud to admit when I'm wrong. 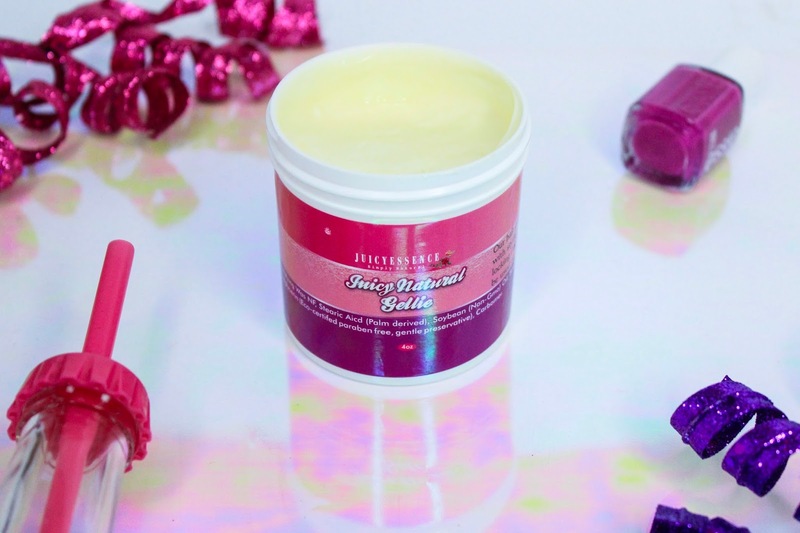 My disappointment didn't last one second, because once I realized that the Juicy Natural Gellie was jam-packed with moisturizing goodness, I started to sing its praises. More than anything, it's like a mega moisture cream that's thick, but not too thick. Something like a super smooth pudding with lotion tendencies. With my disrespectful multi-textured curls, I wouldn't dare try to use Juicy Natural Gellie alone as a curl definer. But in conjunction with some of my favorite gels? Baaaaaaby let me tell YOU! The moisture, softness, and shine is instant and everlasting. During the 5 days I rocked this wash and go, I didn't once have to refresh or rehydrate my hair. Normally, I toss something in it to ward off dryness - but it wasn't necessary this time around. My hair was soft, shiny, smooth, and defined for days on end. Even in LA's 80-something degree January weather. I literally have NOTHING bad to say about the Juicy Natural Gellie. Like, I could say "gimme more product, sis" but the 4oz jar lasts a LONG time. It packs a powerful enough moisturizing punch to make a little go a long way. If you're experiencing dry, brittle hair that's frizz prone and can't seem to stay moisturized (or you've neglected your hair to this point), I've got two words for you: Juicy Essence. Put the Juicy Detangling Mist and Juicy Natural Gellie together and watch the magic begin. Will you be giving products from Juicy Essence a try? Let's chat in the comments below! This blog post is sponsored by Juicy Essence. Nice post. I'd get a kick uncovered of the chance to stamp like this exceptionally attractive time and genuine hard-working work to make a huge article. I am in all actuality content with article quality and direction. You can make use of this custom essay writing service paperwork for any sort of scholastic written work. Our on paper work benefit is having encountered specialists for making a wide variety of activities is competent way. You rock for conservation colossal stuff. I am extremely thanks to say that because it is more helpful to everyone. Nice post. This is very entertaining and effective. I am really impressed in this article. It will be valuable to everyone who uses it, including myself. Thanks a lot!